Jocelynn Lujan, left, and her sister, Jennifer, attend a news conference in 2017 in Albuquerque, where activists denounced President Donald Trump’s executive actions on immigration. Identical Democratic proposals in the New Mexico House and Senate would prevent state agencies from cooperating with federal immigration authorities and limit the authority of sheriffs and jails to hold federal immigrant detainees. SANTA FE – New Mexico, the state with the largest percentage of Hispanic residents in the nation, could be the latest to adopt sanctuary status regarding immigrants, under a Democratic plan. A number of New Mexico cities and towns have declared themselves sanctuaries. 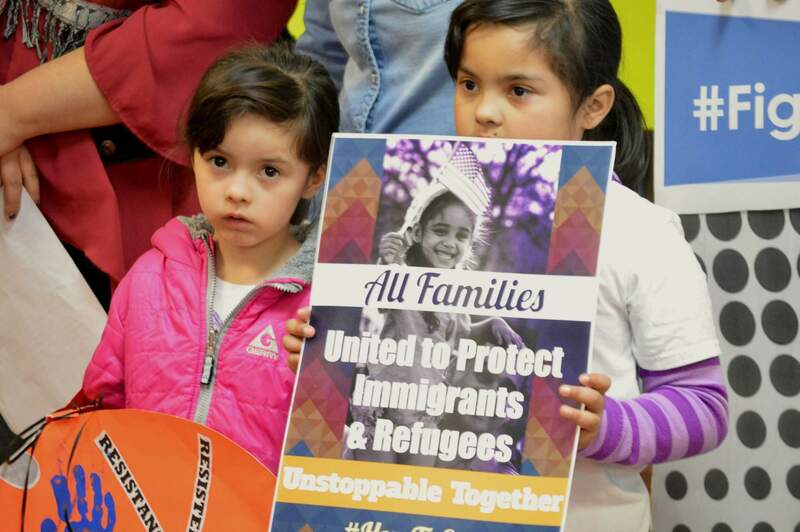 Activists have pressed communities nationwide for the declaration amid immigration enforcement proposals by President Donald Trump. Lujan Grisham served as chairwoman of the Hispanic Congressional Caucus as a member of the U.S. House and has spoken in favor of immigrant rights. However, she did not mention immigration in her State of the State address.